Abstract. Predicting the effects of pyrogenic organic matter (OM) addition (either natural or intentional as in the case of biochar amendment) on soil chemistry and crop yields has been hampered by a lack of understanding of how pyrogenic OM evolves in the environment over time. This work compared the physicochemical characteristics of newly made and 15-month-field-aged biochars and biochar–soil mixtures. 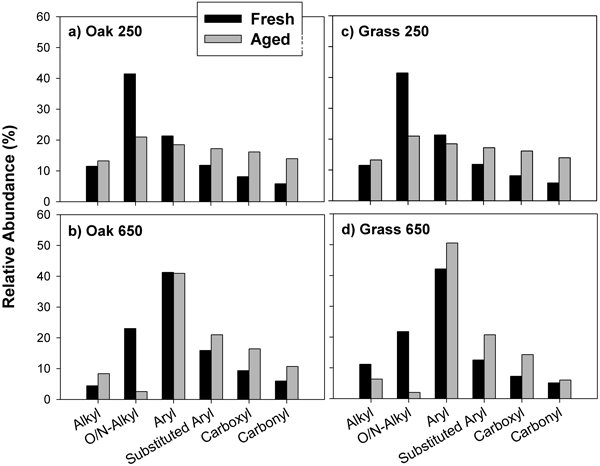 After aging, biochars made by pyrolysis of wood and grass at 250, 400 and 650 °C exhibited 5-fold increases in cation exchange capacity (CEC), on average; appearance of anion exchange capacity (AEC); and significant decreases in pH, ash content and nanopore surface area. Cross polarization 13C nuclear magnetic resonance (NMR) analyses indicated relative increases in O-containing functional groups, including substituted aryl, carboxyl and carbonyl C, and losses of O-alkyl groups. Similar chemical trends were observed for soil–biochar mixtures, suggesting the same biochar aging processes occurred in the soil environment. 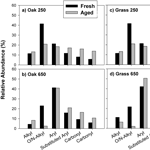 However, there was evidence for a role of soil OM–microbe–biochar interaction during aging. Field aging of soil with biochar resulted in large increases in C and N content (up to 124 and 143%, respectively) and exchange capacity (up to 43%) beyond that calculated by the weighted addition of the properties of biochar and soil aged separately. These beneficial interactive effects varied with soil and biochar type. Scanning electronic microscopy (SEM) images of biochar particles aged with soil showed colonization by microbes and widespread OM coatings. Thus, sorption of both microbially produced and soil OM are likely processes that enhanced biochar aging. Thus, biochar's full beneficial effects on soil properties likely increase over time, and proper assignment of C sequestration credits to biochar users will require consideration of soil–biochar interactions. How to cite: Mukherjee, A., Zimmerman, A. R., Hamdan, R., and Cooper, W. T.: Physicochemical changes in pyrogenic organic matter (biochar) after 15 months of field aging, Solid Earth, 5, 693-704, https://doi.org/10.5194/se-5-693-2014, 2014.